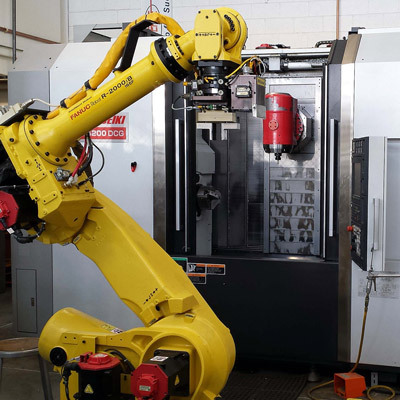 Good machine tending robots bring efficiencies to tasks as varied as sand casting, injection moulding, cutting, machining and small parts assembly. Leading suppliers should have solutions for every conceivable production scenario, from the smallest to the largest and in any cell configuration. They should also offer a comprehensive range of support services, with both local and global support at your fingertips whenever you need it. Compact and equipped with up to six axes, certain types of robot are ideally suited for automated machine tending of small standalone cells. What is more, their powerful controller is capable of controlling the entire cell as well as additional peripheral axes. Because space is already at a premium in most production facilities, many machine tending robots have a small footprint. They also come fitted with water and dust protection as standard and cables routed through the wrist, out of harm's way. Some manufacturers even have small models that go straight into the machine tool. 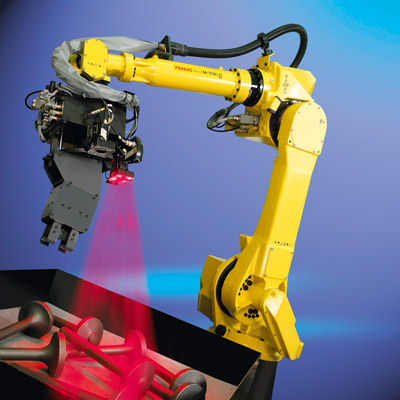 You can use robots for a range of additional cell-related tasks such as quality control, specification checks and surface inspections. 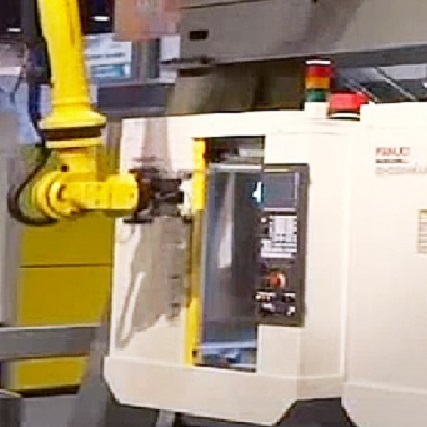 With a wide range of tool changing station mounting options, including top mounting, some types of robot serve as highly efficient tool changers. Capable of working with a huge range of tools, these models can handle any number of tools regardless of their weight. 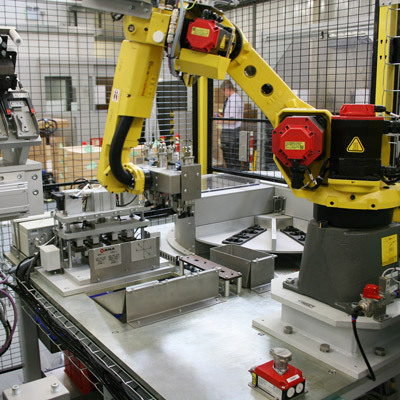 Robots are invaluable when it comes to injection moulding. 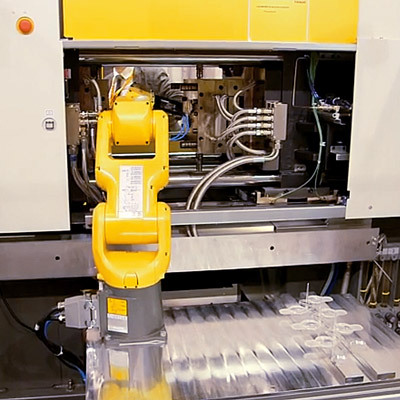 From part removal, to screw cutting, degating, labelling, lasering and adding inserts, they increase throughput across a varied range of tasks and negate the risk of damage. 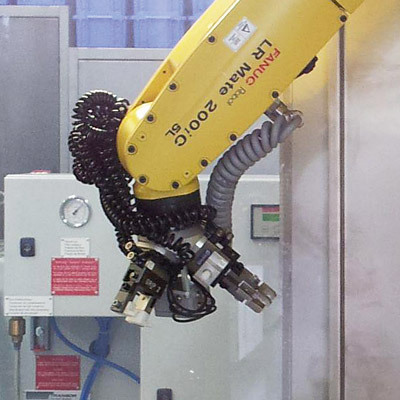 With a range of rail, floor, wall and ceiling mounting options to save space and expand your robot's work envelope, some makes of robot are ideally suited to tending multiple machine tools - increasing your throughput and maximising production time. 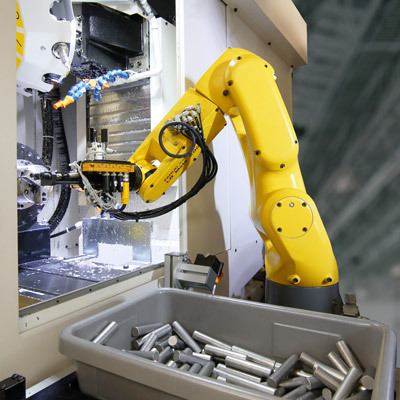 To speed up processes involving parts bins, vision based bin picking solutions enable robots to identify, select and load parts from a container. 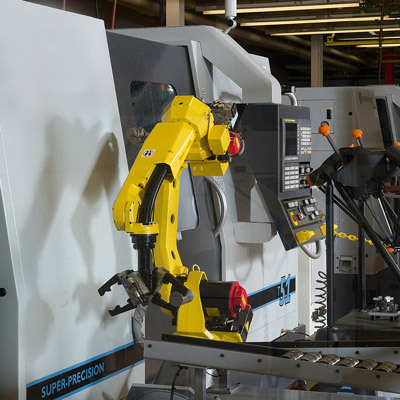 Sometimes boasting uptimes of 99.97 per cent, this automated machine tending technology dramatically speeds up even the fiddliest of picking tasks. Tending machines is a job that most people are unwilling to do. 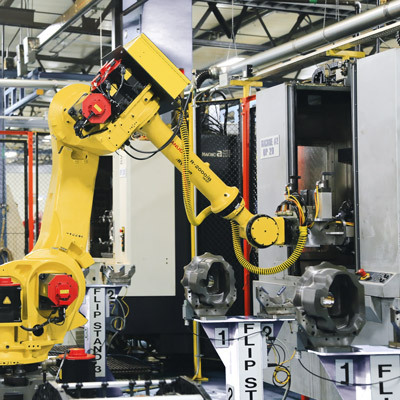 Good robots by contrast provide 720 hours of seamless production, multi-tasking between cells, loading and unloading parts and the ability to link up to eight machines. 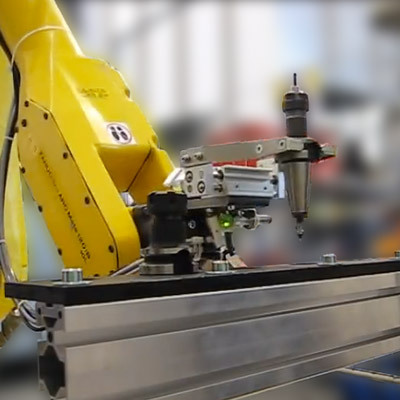 Extremely lightweight and compact, dedicated tending robots available from some manufacturers have been specifically designed for high-speed applications such as automated machine tending. With their slim arms, enclosed cabling and 7 kg payload, these specialists are ideal for manufacturing operations that require access to small spaces and where space is at a premium. 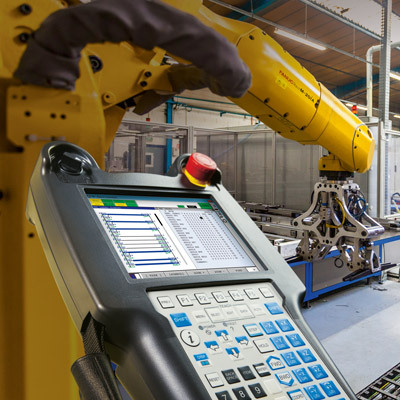 Manufacturers with proven expertise in vision systems can equip robots with intelligent vision options that make a vast array of machine tending operations possible. Options often include 2D vision for part location, 3D vision for part detection, positioning and orientation, visual line tracking for conveyors and area sensors for bin picking. With 250 software functions, we have the right solution for your application – just tell us what you need. 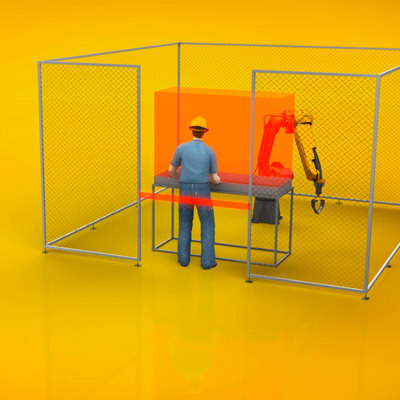 On robots equipped with an optical scanner, the ground-breaking safety software provided by some manufacturers enables you to dispense with traditional space-taking constraints such as fences and safety hardware. 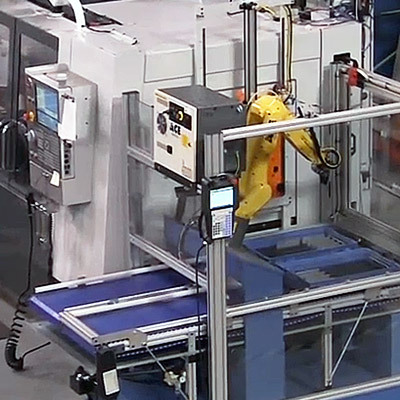 Instead, this functionality restricts the robot to specific zones and by slowing it down, enables the operator to enter the work envelope without shutting down production. 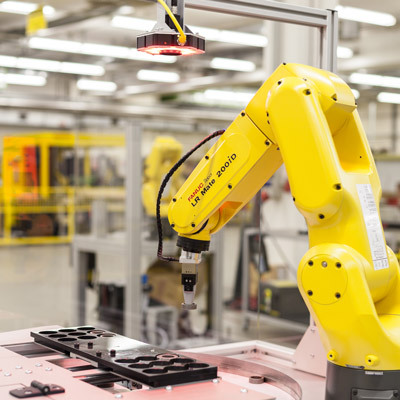 On jobs involving more than one process, the best robots change grippers quickly to maximise production time. A comprehensive range of flexible standalone solutions make machine tending robots a very viable choice for small businesses. Less expensive and easier to use than you might imagine, they provide considerable benefits even on small production runs. This is especially so where the tedious, dirty and dangerous nature of tending machines manually makes finding and retaining manual operators difficult. Plus, once they have been created, machine-tending programs can be called up whenever new orders come in.